Retinal degenerations severely impair the visual performance and thereby the human social interaction. With more than one million people affected worldwide, Retinitis pigmentosa (RP) is one of the most common retinal degenerative diseases . RP leads to loss of photoreceptor cells, finally causing blindness. A single gene defect is sufficient to cause RP, but to date mutations in over 150 genes have been associated with RP , which leads to varying disease phenotypes and makes a therapeutical approach such as gene therapy intricate if not impossible. As there is no neuronal regeneration in the mammalian retina, photoreceptor loss and the subsequent loss of vision is irreversible. So far, several genetically engineered animal models exist to study the disease in vivo. RP pathology, i.e. photoreceptor degeneration, can also be induced by N-methyl-N-nitrosourea (MNU). MNU has been shown to cause the selective and progressive degeneration of photoreceptors in mice, rats, and non-human primates [3-5]. It is an alkylating agent and leads to a DNA adduct formation in photoreceptor cell nuclei, followed by apoptosis . Although there are differences between the disease development in RP and the mechanism of MNU, the resulting phenotype is comparable . So far, no effective treatment strategy has been found to regain the lost vision in humans. In contrast, non-mammalian vertebrates, like amphibians and fish, have robust regenerative responses to injury, which can lead to near complete restoration of the neurons lost through the injury . This regeneration occurs efficiently from radial glia-type stem/progenitor cells . In the retina of most vertebrates exists only one type of macroglia, the Müller cells . Therefore, investigations of its regenerative properties have been launched in recent years. Thereby, neurogenic changes have been observed in the injured retina, and the source of injury-induced neurogenesis was traced to the Müller cells . Furthermore, it has been shown that purified Müller cells from the rodent display cardinal features of neuronal stem cells in vitro; they self-renew, and, in addition, generate retinal neurons and glia under conducive culture conditions . 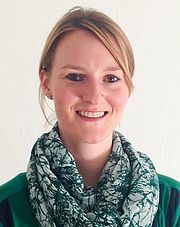 I started my PhD at the Department of Ophthalmology at the Inselspital in Bern, Switzerland, under the supervision of Dr. Volker Enzmann in collaboration with the group of Prof. Andreas Reichenbach at the Paul Flechsig Institute of Brain Research in Leipzig, Germany. In this project, we aim to investigate, whether mammalian Müller cells bear the capacity to serve as an adult stem cell source in the injured retina and can be triggered to dedifferentiate and redifferentiate into the lost cell types. To induce retinal degeneration, mice are treated with MNU. Post treatment, several changes can be observed in the retina. TUNEL positive nuclei appear in the outer nuclear layer (ONL) and the number of cell nuclei in the ONL severely declines. In contrast, the inner nuclear layer (INL) stays intact (Fig. 1). Figure 1: A-D: Cell death in the ONL after MNU-treatment of the mouse retina. 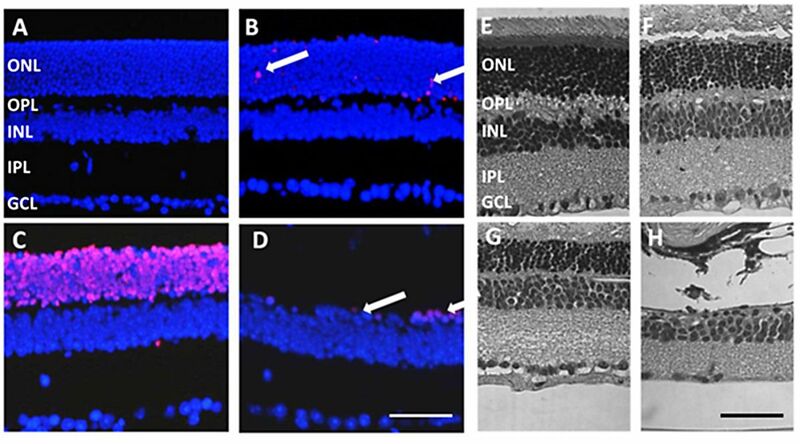 A Cells do not stain positive for TUNEL (red) in the retina of untreated animals. B A low number of TUNEL positive cells (arrows) appear in the ONL 1 day post injection (PI). C Abundant TUNEL staining can be observed in the ONL 3 days PI. D 7 days PI, only one row of the ONL is left, therefore the number of TUNEL positive cells (arrows) is low. Nuclei were counterstained with DAPI (blue). E-H: Hematoxylin and eosin staining of MNU-treated retinas. E The retina of an untreated animal shows a preserved structure with clearly distinct layers. F No significant changes can be observed 1 days PI. G A visible decrease of the ONL thickness occurs 3 days PI. H 7 days PI, only one row of photoreceptors is left in the ONL, the retina looks severely disturbed. GCL: ganglion cell layer, IPL: inner plexiform layer, INL: inner nuclear layer, OPL: outer plexiform layer, ONL: outer nuclear layer. Scale bars indicate 100 µm. Under physiological conditions, murine Müller cells do not express glial fibrillary acidic protein (GFAP). Upon photoreceptor degeneration, Müller cells are activated and start to express GFAP (Fig. 2). Fig. 2: Immunohistochemical analysis of Müller cell marker expression. A Murine Müller cells express cellular retinaldehyde-binding protein (CRALBP; green). B After MNU-treatment, activated Müller cells also express GFAP (red). Scale bar indicates 50 µm. Furthermore, preliminary analysis of transcription levels shows that progenitor markers (Sox2, Pax6) are transcribed in the degenerating retina, suggesting that Müller cells convert into a stem/progenitor-like cell. To further characterize the changes of Müller cells in MNU-induced retinal degeneration, I am currently studying electrophysiological properties of Müller cells from MNU-treated animals. It is known from other retinal degenerations (e.g., ischemia  or diabetic retinopathy ), that rodent Müller cells alter their membrane properties, such as potassium conductance, capacitance or membrane potential. Our goal and future work is to reveal possible pathways (Fig. 3) and mechanisms involved in Müller cell activation and alteration upon photoreceptor degeneration. 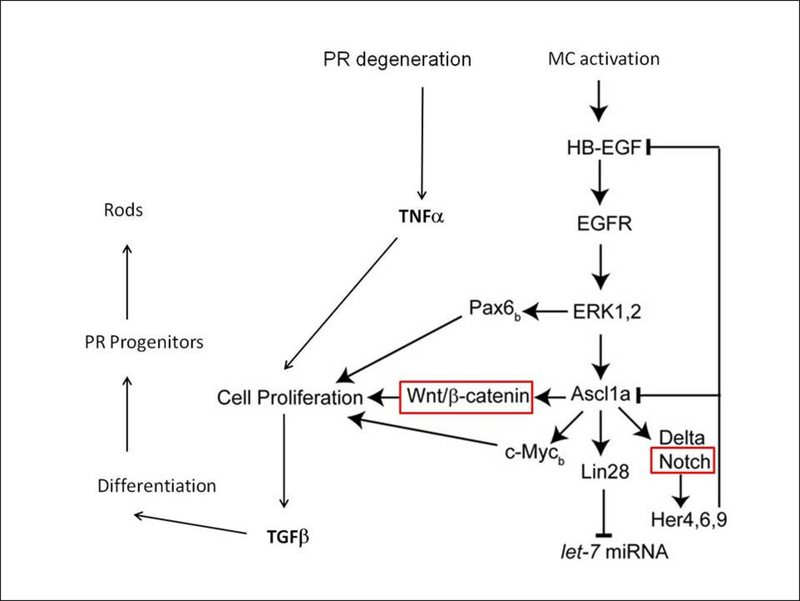 Key players might be growth factors (EGF, TGFβ) and transcription factors (Ascl1, Pax6) that induce Müller cell proliferation and subsequent differentiation into photoreceptor cells. Figure 3: Scheme of pathways that are possibly involved in Müller Cell-based photoreceptor (rod) regeneration in the zebrafish, modified after Wan et al., 2012 . Further, we wish to compare our results with findings from the zebrafish, an organism capable of retinal regeneration, to draw conclusions about the capability of mammalian Müller cells to function as an endogenous source for retinal regeneration. Thereby, the MNU model can serve as an useful tool as it induces photoreceptor degeneration in both species and leads to complete regeneration in the zebrafish .